New Crypto Heater. Make money and save money. So what if you could earn a bit of coin or “bitcoin” at the same time as warming up your house. Well apparently now you can. A French startup called Qarnot has introduced a new crypto heater that they claim can pay for itself by mining crypto currencies. They have a patented technology that is designed to dissipate a soft heat. The QC-1 is an extension of the Q.rad computing heater that was released in 2013. Mining is an important part of the crypto currency ecosystem and refers to a process of solving complex math problems in order to perform transactions on the blockchain. It has been discovered that a Graphics Processing Unit (GPU) card can process or hash computations better than a standard Central Processing Unit (CPU) that can perform multiple functions. GPUs are great at math and are more focused in operation. While mining and solving math problems you can earn coins. This process however requires lots of processing power that inherently generates lots of heat. This new device takes advantage of this byproduct and uses the generation of heat to an advantage. 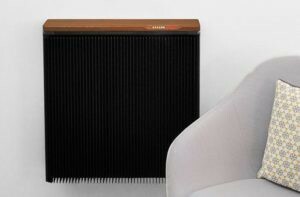 The crypto heater design is kind of retro and resembles a radiator with fully integrated materials such as wood and aluminum. It has a black grille and wooden top that makes it look like a piece of furniture to more easily blend into any room. The device supports a captive touch, mobile app, and Web app interface, it also provides a Ethernet RJ45 port. It is marketed as a simple plug-n-mine device that can be setup in 10 minutes. 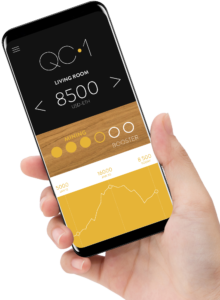 The overall setup consist of plugging in the power plug, the Ethernet connection and entering the crypto wallet address on the mobile app. This new crypto heater is setup out of the box to generate Ethererum but can be setup to mine Bitecoin and Litecoin as well. The heat of the QC-1 is generated by 2 AMD Radeon RX580 graphics cards with 8GB or RAM embedded into the device which can generate about 60MH/s. In normal operating mode the QC-1 can generate about 450W of heat. Customers can turn on Booster Mode to generate another 200W with a total of 650W. Qarnot claims that the device is noiseless and runs at 0dB because there are no fans or hard drives inside. 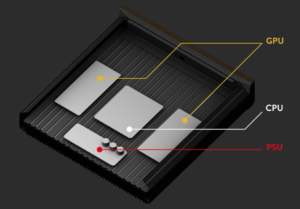 Qarnot indicates the QC-1 Crypto heater is capable of heating a 20 square meter room. There is also a handy mobile app that you can use to monitor the status of your mining efforts as well as control your heat. Users will be able to monitor their account and activate the heating booster mode. You can also monitor how the crypto markets are trending. The QC-1 is available for around $3,570 + $300 shipping USD online and Qarnot will make them in batches. If you reserve one before March 20th the company says it will arrive in the first batch before June 20th. The price does seem quite expensive but the expectation is that you can earn around $120 USD a month mining Ethererum at the current price. Not including your power usage cost for the electricity to power it. So what do you think? Is it crazy? It’s hard to tell how well it works without some real data over a winter. Based on the above it does seem like a lot of money to spend on a mining rig. For that price you could build a high-end gaming PC with comparable hardware and mine yourself. At least that way you could also play games, check email or browse the web. At this point the Return On Investment (ROI) would be something like five years or so before it paid for itself. Don’t get me wrong, I think the concept is great and mining generates a lot of unused heat. So, if you’re into crypto mining and also want to cut down on your heating bill this just might be the thing for you. Also check out our article on smart home benefits and other ways to help you save money.